In San Diego and throughout the State of California, divorcing parents may agree, or a court may order that only one parent have sole physical and legal custody of their children. In the divorce case of the famous pop star Michael Jackson and Debbie Rowe, the parents agreed that Jackson would have full custody of their two children. According to a news article, in 2001, Rowe, mother of Paris and Michael, relinquished all of her parental rights when the children were merely toddlers. This is not something most parents would be willing to do. In fact, to the contrary, it is fairly common for divorcing spouses to argue over custody rights, each seeking to spend as much time with their children as possible. Parents facing child custody issues are strongly encouraged to reach out to an experienced, San Diego Family Law attorney who can help to safeguard their rights within the state’s intricate legal system. Most parents would never agree to grant the other spouse sole custody of the children. Under this arrangement, only one parent would have the right and responsibility to make the significant decisions about the education, health, and welfare of the children. Michael Jackson and Debbie Rowe were married from 1996 to 1999. Some time in 2001, Rowe signed away all of her parental rights. After Michael Jackson’s untimely and tragic death in 2009 at the age of 50, his mother, Katherine Jackson became the children’s legal guardian. In California, a court may order someone other than the child’s parent to be a guardian and have custody of the child and/or manage the child’s property, also known as the “estate.” In a guardianship of the child, the guardian would have the same responsibilities to care for the child as a parent would. Being a guardian is a considerable and serious role in a child’s life. The guardian is responsible for the child’s: 1) food, clothing and shelter, 2) overall safety and protection, 3) physical and emotional growth, 4) medical and dental care, 5) education and any special needs. According to reports, Katherine Jackson, as guardian of the children, has reached an agreement with Rowe to allow her supervised visitation rights. A judge will order “supervised visitation” if there are issues of protection and safety, among other things. In effect, a child may only have contact with the identified person when a neutral third person is also present during the visitation. It is not clear from the news accounts whether the court has been involved in ordering the supervised visitation involving Rowe and Paris, or if it is simply an agreement between Katherine and Rowe. In any event, one of the situations in which a court will order supervised visitation is to help reintroduce a parent and a child after a long absence, just like in the Jackson case at issue. Although this is an extraordinarily public family with very unique circumstances surrounding the children’s birth and separation from their mother, the family law proceedings have involved many legal issues that take place in the San Diego court system every day. It is important to have an experienced attorney on your side to help guide you through the process. If you are a parent with questions about child custody and visitation matters, you are encouraged to contact Doppelt and Forney, APLC . Mr. Doppelt is an experienced family law attorney representing parents for more than 20 years in Southern California. Doppelt and Forney, APLC serves clients in Linda Vista, Encinitas, Scripps Ranch, San Diego, and throughout Southern California. 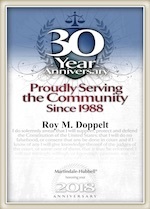 For a free consultation with a dedicated and experienced family lawyer, contact Doppelt and Forney, APLC through the law firm’s website or give us a call toll-free at (800) ROY IS IT (769-4748).